It has been a week of unexpected treats, the foremost is that I have been given a hovering up fork and I am chuffed to bits. This was a super practical surprise gift from a very special friend and I could not be more delighted. 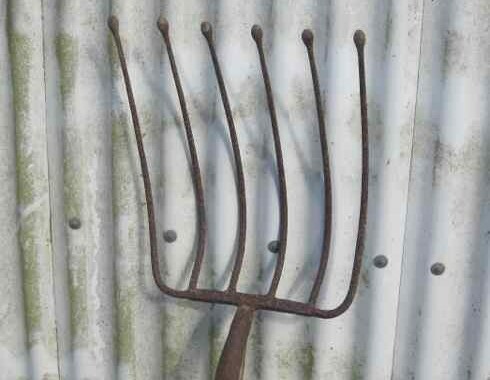 This is the fork he had always used for hovering up his hops as they sat on the drying floor in the oast house for their allotted drying time and which he had found perfect for purpose. Hence he thought I might like it! Like it, well I am jumping for joy. When traditionally drying hops with charcoal in an oast house I do not then have the advantage of the modern oil unit fans which force air through the bed of green hops. With this traditionally method of drying hops you utilise natural draft, so I needed to find a way of hovering up the hops as they sat on the kiln during their designated drying time. Hovering up basically means moving the hops very gently by lifting the hovering up fork through the bed of hops to carefully loosen any compact areas by shifting their positions. This ensures even drying, hence this gift could not be more perfect or, more perfectly timed. When drying hops in this old-fashioned way, it not only takes longer but I keep the temperature within the lower drying range to preserve the natural oils in the hops. I had been toying with different ideas of how to make a flat pronged wooden fork for hovering up the hops, but the round ends on this one prevent you getting all in a toe-tangle by catching up the lifter clothes under the hops. Before my friend upcycled this fork it was not originally made for hovering up hops. 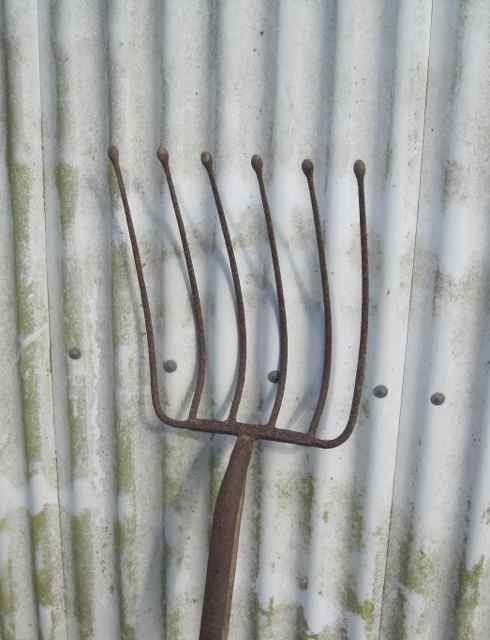 I understand it was a root crop fork which would have been used to move root crops like turnips and mangels. 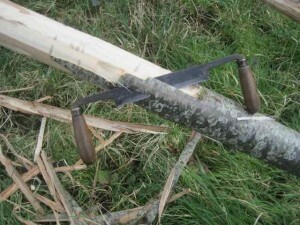 The rounded end simply prevented the roots from being spiked. The second treat was that the sun shone this week making banding-in a pleasure and still no chilly fingers this year. I think this is a record and we should wrap up the banding shortly. Thirdly, while not exactly a treat as such, I have finished a seasonal job which is satisfyingly rewarding. So with the sun shining I completed debarking some chestnut poles for the new section of the hop garden. Normally the hop garden would go up before the hop setts were planted but this time, it is of necessity back to front. Then the ground was far too wet this winter to get on it with a tractor to auger in the hop poles prior to planting. So the hop setts went in and as soon as the ground is dry enough these poles can be put in to make the extension. Wirework and hooking for the stringing can then be added to the poles, as I said a very back to front. The Sussex Zig Zag is proving to be unorthodox all round! Whilst shaving the chestnut I thought how amazing the patterns on the bark were, a close up shot could almost be mistaken as an image of the earth from space. Here in the High Weald we are blessed with acres of stunning ancient woodlands and miles of hedgerows, amazing in their variety of species. However, there are huge clouds in the landscape, I cannot say horizon as these problems are already upon us, we have a tree disease which is affecting our sweet chestnut trees . 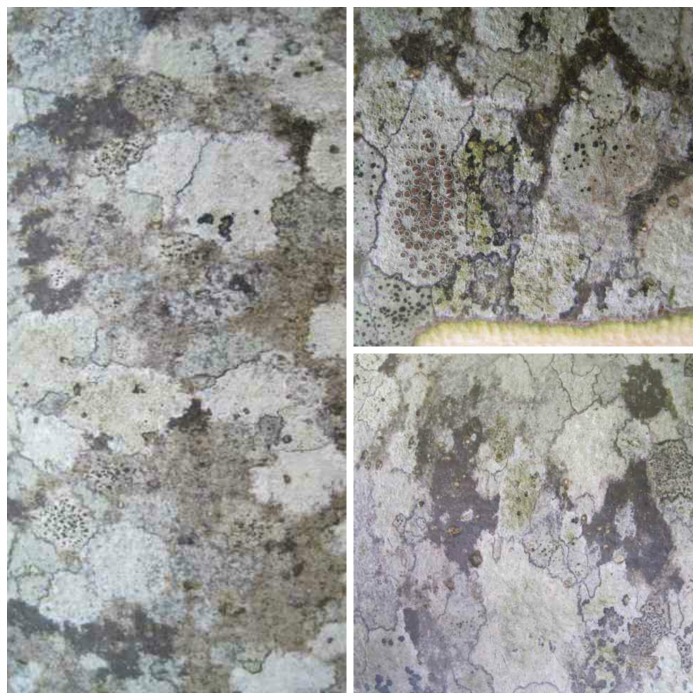 This is in addition to the serious Ash and Oak die back diseases, and horse chestnut problems. With that and the huge deer population now ensconced in this area, our beautiful woodlands are seriously threatened.